To help John De make a full recovery, we will be joining together to beat the crap out of each other and find out who can be more badass than ol' Johnny boy. The man with the broken ticker, who restarted his own heart just by falling over, will be greeted back with the violence we know how to do best. So we think that it's best that we try to revive John De's spirits and beat these bad times into submission with a high dose of low cholesterol lead bullets and defibrillating laser beams. We will be hosting an MWO EpicOp on Saturday, July 29th 2017. 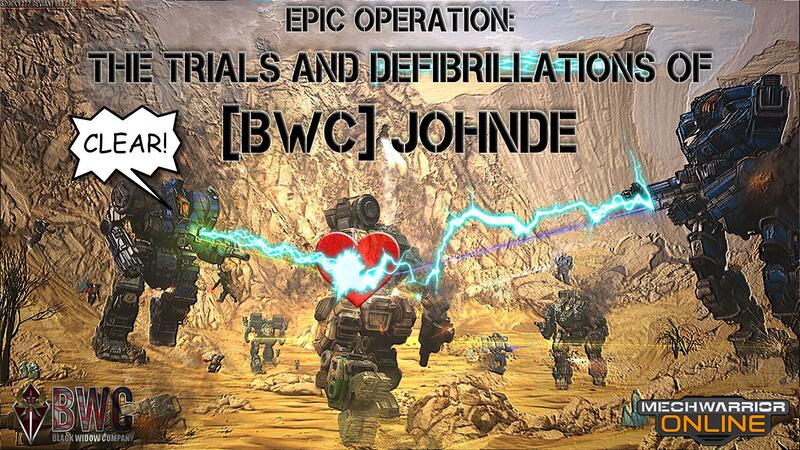 The Trials and Defibrillations of John De will be held at 11:00 Eastern/Opserv time. This event will be a round robin team style tournament involving only stock/trial mechs with victory tracking of each player and leading to a Grande Melee finale. The BWC is driven by volunteers, and today we honor those of us who have gone above and beyond to make this gaming community the best one out there. Though this is a regular announcement for BWC, what we showcase here is nothing short of extraordinary. For Operation attendance during June, Vik1ng has been awarded for Soldier of the Month. - HighPlains_Drifter, MWO RCO For leadership credits during Operations in June, Prozone has been awarded for Leader of the Month. several times. For his willingness to step up and contribute, we award Seler the Solider of the Month. worked with PAO to publish the ALCON, Front Page Article, and the Pixel Warriors to create the awards. in leading the charge on this, we award Gyun the Leader of The Month. - SC Game C&S Leader of the month goes to Aniron in stepping up to conduct someone else's scheduled OPs that couldn't make it. someone isn't going to be able to do something and we need people who is not afraid to step up and take the reigns. and thus we are proud to award him the SotM ribbon. are proud to pin him the Leader of the Month ribbon. enjoyable and exciting. We are proud to pin him the SotM ribbon for his work. continued vigilance in keeping us up-to-date and relevant in the fast-moving world that we operate in today. halfway across the world, we are proud to pin him the Leader of the Month ribbon. It is always a pleasure to recognize the dedication of our soldiers and leaders who selflessly dedicate themselves to helping their fellow peers and maintaining the principles upon which our organization was founded upon. We are a community of gamers first and foremost, and there wouldn’t be a community as great as ours without the efforts of people such as those named above. Once again, thank you all so much for your service to the continued excellence of the Black Widow Company. All times are GMT-5. This page was generated at 01:15.